Trampili elephant grip toy with rattle is 13 cm tall. It's perfect for your baby's tiny hands. The soft and cuddly plush fabric for your baby's soft skin has been crafted in grey and blue. The inner ears, paws and the grip toy are made of fluffy blue material. The blue scarf with white spots is sewn into place. The grip ring features the logotype "Steiff" embroidered on it in dark grey. 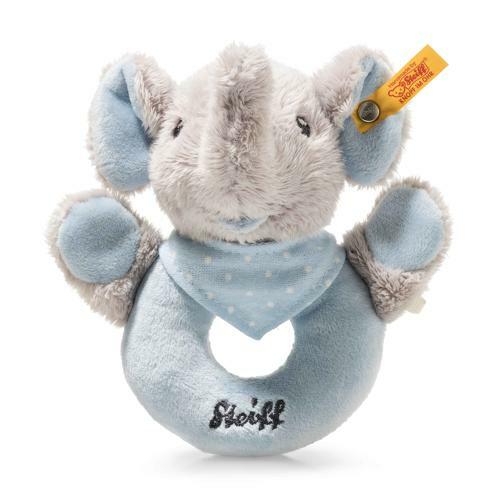 The elephant head has a rattle inside it, which means the toy will appeal to your baby's sense of hearing in addition to touch.